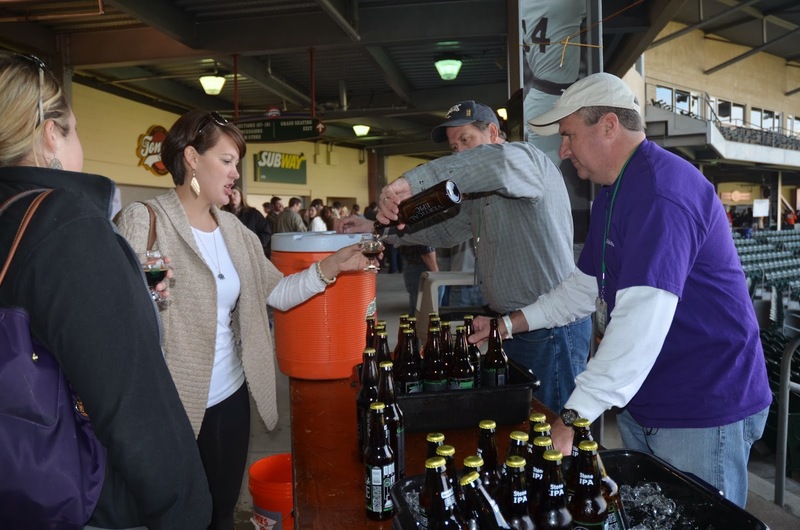 Now that the turmult and shouting, or rather, the tasting and cheering are over with, a look back at a fantastically successful event, just down the road at Fluor Field. First, gotta get an wrist band. No wrist band, no beer! Quest was one of our local representatives. Thomas Creek was another. Next year, there'll be even more locals. Spartanburg was represented; RJ Rocker rocked! Down from Asheville, Green Man made this guy (and me) happy. Wicked Weed, another Asheville favorite made the trip down the hill. My apologies to the band, failed to get their name. Greenville Hop House was represented by a pretzel-loving bearded guy, named Andrew Myers. All the way from N.California, Anderson Valley poured to wild acclaim. Another CA brewery, from San Diego county, Green Flash. Local home brewing supporters Greenville Hop House poured some of their own. Austin is handing me my favorite of the day, Imperial Kashmir IPA. Yum! 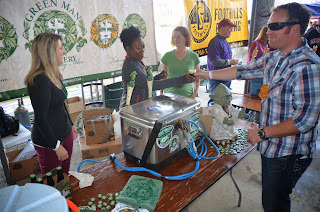 Down from Brevard, Oskar Blues had a lot of fans, me included. Where did I put that pic of Amy? If you can, try to find their Laughing Skull. Personal favorite of mine. Stone (San Diego county again) had IPA nectar for us hop fiends. Still Water stayed busy as you can see. Athens, GA, sent us Terrapin with Hopsecutioner and the line was long to get it. Even the yeast had a wild time. And start planning for next year! The Second Greenville Craft Beer Festival will be even better, I suspect. See ya there, Cheers!